Conker Statistics sponsored the Chipping Norton ice skating event of the year at The Holy Trinity Primary School. 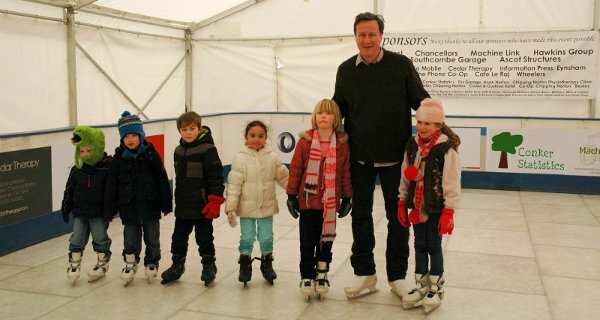 Brushing away the festive cobwebs the Prime Minister, David Cameron, attended the sell out event and confidently skated a few laps and assisted children on the slippery surface. The Challenge event, provided by Conker Statistics, involved estimating the size of the ice rink. Over 150 people took part in the activity and the lucky winner, 5 year old Saffron Williams from the Holy Trinity School, was awarded a certificate and prize during school assembly. The data set from the challenge motivated some interesting investigations – Are people more likely to underestimate or overestimate areas? Who were better at estimating i) Boys or Girls? ii) Adults or Children?